Moroni was the last to write on the plates of Mormon. He sealed the record with his testimony and called upon God as his primary witness of the truth of the records he was sealing up. He exhorted his brethren, the Lamanites (see Moroni 10:1–23). He admonished readers to ponder the words of the Book of Mormon in their hearts (see Moroni 10:3) and then to ask God with real intent, having faith in Christ, "if these things are not true." 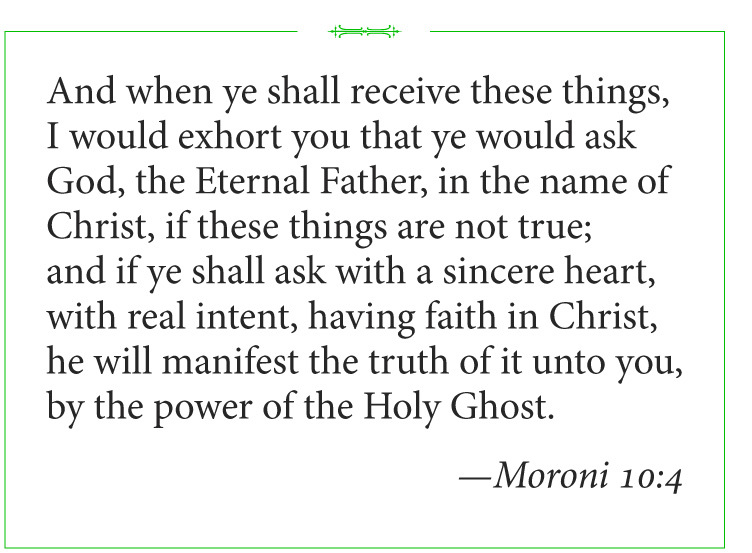 He testified that God will manifest the truth of the Book of Mormon by the power of the Holy Ghost and that "by the power of the Holy Ghost ye may know the truth of all things" (see Moroni 10:4–5).